There are many situation where you need an on demand hot water dispenser. Think of these as mini tankless water heaters that provide on demand, hot water where ever they’re installed! These are designed to provide sinks with hot water supply, making it easy to install a kitchenette or powder room anywhere in the house. Of all the choices that are available, our top pick is the InSinkErator H-WaveC-SS Instant Hot Water Dispenser. There is a reason this system is so popular, and the quality of the parts and large capacity 2/3 gallon stainless steel tank make this an excellent choice. Looks great, easy to install and comes with a 3 year parts and in home warranty. Get on demand hot water anywhere you have a water supply line! For today’s hectic world, a great hot water dispenser provides the essence of convenience. It accelerates all forms of kitchen chores from preparing soups, sauces, and hot drinks to warming your baby’s bottle. In addition, it purges berry stains and even melts wax from your clothes. 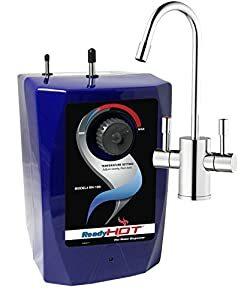 The best hot water dispenser takes the hassle and lag time out of many tasks that used to need boiling water on gas or stove. This device adds elegance to your kitchen and saves you time that you would waste when heating water using a kettle. The gadget offers you near-boiling water that is ideal for making tea, hot cereal, coffee, removing candle wax from holders, preparing baby bottles, quickly cleaning dirty pans and pots, among other uses. The machine uses a very simple mechanism to heat the water. Water comes from a supply tank into this special device, where it is heated to 200 degrees F. As you use the water, it is instantly replaced. In fact, it has the ability to provide about 60 cups of hot water within an hour. The other great feature of this product is that it fits an ordinary 1.5-inch hole on the countertop or the sink and uses a grounded power source under the sink. It also boasts of tool-free installation to ease installation and comes with dry start protection for additional safety. This dispenser is one of my favorite dispensers because of its ability to save energy – it consumes low energy that translates to cheaper cost. It also saves water due to its instant heating ability. This is especially supported by a research that showed that near-boiling water may save up to 80 percent of the heat needed to heat water to 200 degrees F.
Features large capacity 2/3-gallon – stainless steel reservoir. Boats of hot water auto shut off. Produces 60 cups of hot water per hour. 3 years in home and part warranty. Waste King comes with a 1300W hot water reservoir and a Coronado collection faucet (it uses a combo system that features both hot water tank as well as satin finish faucet). The product will enable you to add the much-sought convenience of hot water to your house for various uses. It provides near-boiling water of up to 190 degrees F to aid you to make instant drinks such as hot chocolate and tea, instant soups, among others. The other great feature of this machine is its simple adjustments that allow you to switch the temperature from 140 to 190 degrees F in a second. Its 1300W heating element offers a fast heat recovery, and the 5/8-gallon tank provides about 100 cups of hot water per hour. The device is energy efficient; uses less energy that a 40W bulb and often cost you less than $2 every month. The dispenser features an insulated stainless steel reservoir that isn’t under pressure and its self-contained expansion chamber eliminates dripping. 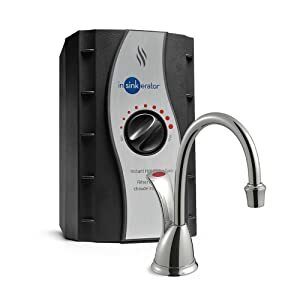 In addition, it is very easy to install this gadget as it comes with an easy-to-install as well as improved connection that reduces the chances of twisted or kinked water lines. Add elegance and convenience to your kitchen. Features a 1300W hot water tank that provides up to 100 cups of near-boiling water per hour. Features a safety feature that enables decreases and increases in temperature. Produces 100 cups per hour. There are products that offer up to 200 degrees F.
For many decades, the only solution to hot water was a microwave or stove heating that used to consume a lot of energy, time, and money. However, this is not the case anymore because this product delivers instant hot water of up to 200 degree F within a second. What is even amazing is that you don’t need to waste any excess water (a common case with ordinary boiling) because it produces just what you want. Additionally, the Ready Hot dispenser comes with a chrome dual layer faucet and offers hot water at your fingertips. This near-boiling water is perfect for preparing instant foods and beverage in seconds including soups, cocoa, coffee, vegetable, and pasta. Furthermore, the device is suitable for other home uses such as warming your baby’s bottle and food or cleaning pans and pots. The machine is able to produce up to 60 cups of hot water per hour which is enough to cater for most of your needs. The other great feature of this gadget is its automated heater protection that prevents the tank from being burnt in case the water is completely used. The disperse features a 780W tank that recovers heat instantly. It also comes with a dual lever for cold and hot water. High capacity offers up to 60 cups of near-boiling water per hour. Features an automated heater protection. With premier 141030, you only need to turn a knob to get hot water for soups, coffee, gelatins, tea, or any recipe that needs to be boiled water. The device enables you to save energy, costs, and time when preparing these recipes (it only costs you a penny a day when operating it). The device also boasts of a thermostat adjustment that enables you to control the temperature using your fingers. The other notable feature of this product is that it provides about 60 cups of hot water per hour and has a chrome finished spout which is durable. The machine also comes with a stainless reservoir that comes with a saddle valve for better installation and uses three-wire grounded power source. Other great features of this product are its 780W, 15-20Amps, 115 volts AC as well as a one year warranty. The product comes in a beautiful design that is ideal for counter tops (makes them beautiful). This is a great addition for every home. Features an instant 190 hot water knob. Ideal for soups, tea, coffee, gelatins, and more. Saves energy, costs, and time. Provides up to 60 cups of hot water per hour. Comes with a stainless steel tank. Its capacity isn’t the best on the market. This stainless steel reservoir tool holds 1/2 –gallon of water and produces 60 cups of hot water per hour. The product produces near-boiling water of about 190 degrees F that is perfect for most household uses. The tool boasts of a huge tank that measures about 11.2 inches by 6.8 inches by 8.1 inches. What is even amazing is that it is quite easy to install this product – it easily changes your kitchen into a hot water room. 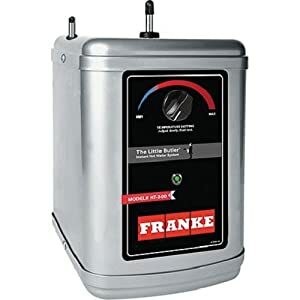 The device is easily used with the Franke water filtration system to offer contaminant free and clean cooking and drinking water, making it perfect for all your family needs. It will enable you to easily access the right temperature water when you want to prepare your recipes such as drinks and foods. My friend uses this device for making soup, tea, and evening washing items. It is very hot and ideal for finish cleaning items. This is his second. The first one had a small problem after eight years of use. Features a stainless steel tank of 0.5-gallon. Produces up to 60 cups per hour. 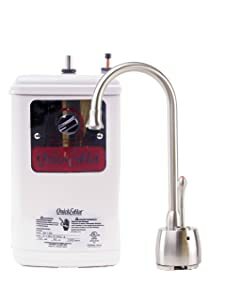 It is easy to connect this device with other filtration systems. Might leak after years of use. Filter – Some of the best water products come with a filter. However, filters might make it harder to fill the water reservoir. Side water gauge – This will enable you to see the amount of water left in the reservoir. Space under water outlet – How spacey is it under the product outlet? Does it have sufficient room for tall/large mugs to fit there and is there room to move normal teacups and mugs in and out from the outlet? Audible low water indicator – This is only available on some brands and lets you know when to refill the tank. Rubber feet – Rubber keeps your tool steady on different types of surfaces. It is a great addition as a safety measures. Removable water tank – This feature makes it simpler to refill your device directly from a tap. Go for a gadget that has a removable tank. On/off indicator – A well-labeled indicator light is a vital feature that will let you know when your machine is ready to use. Removable drip tray – This prevents water from spilling onto surfaces. Locking lid – A quite helpful safety feature. Thermal cut – This prevents overheating. Manual stop button – Enables you to prevent water being dispensed mid-flow. Thermostat – Thermostat enables you to change the water temperature by adjusting the thermostat dial. Service – Most hot water tools will require servicing after a few years of use. 1. Where will you be using your unit? At home, at a gym, at the office, at a guest area, or for your workers. 2. How much water will you need every day? Consider getting a bigger dispenser if lots of people will be using the device. On the other hand, a larger unit might not be ideal for one or two persons. 3. Do you want cold and hot water? Some products will produce both cold and hot water or you may select just the brand that produces hot water. 4. How much space do you have for keeping your device? Depending on the amount of space you have, you might want to buy a device that sits up on the counter or that hooks to the wall. 5. What design do you like? There are lots of finishes that you may select from that might be attractive and of high-quality. There are various types of water dispensers on the market today. Each type has its unique features, benefits, and disadvantages, but it’s good to understand what each of them is able to do. Bottom or top loading dispenser – It requires a jug that is placed on the unit to provide you with water. It is easy to fill – so you will always have water. Point or bottles of use dispenser – It provides water through a water line or tap in the wall. It is a bit hard to install – you will need a plumber. Portable dispenser – It is easy to place this device on your counter. It is small but holds water for your daily use. Here is a video on how to install a water dispenser. The best hot water dispenser is the most innovative household or office accessory that you will ever have. It eradicates the need for bulky and expensive heating apparatus such as kettles. In addition, a dispenser is a durable and a reliable option because it minimizes your water contamination. 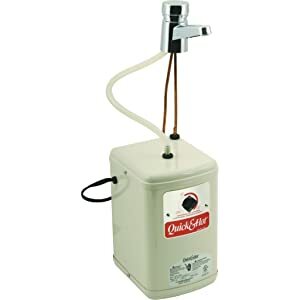 What is even amazing about a water dispensing tool is that you don’t need any special knowledge to operate it (it is operated by even small kids). A dispenser is also safe and easy to install. With all that in mind, it is not easy to get the best dispenser due to many brands that have flooded the market. Luckily, we have already given you a comprehensive review of these products. All in all, InSinkErator H-Waves-C-SS Dispenser is one of the best devices that you should consider having in your kitchen. This device adds elegance to your kitchen and saves you time that you would waste when heating water using a kettle. It also uses a very simple mechanism to heat the water.